Paris, 05.11.1901, 3 % Obligation über 500 Francs, #38893, 33 x 36 cm, grau, grün-grau, KR angeklebt, Knickfalte längs, hochdekorative Gestaltung. 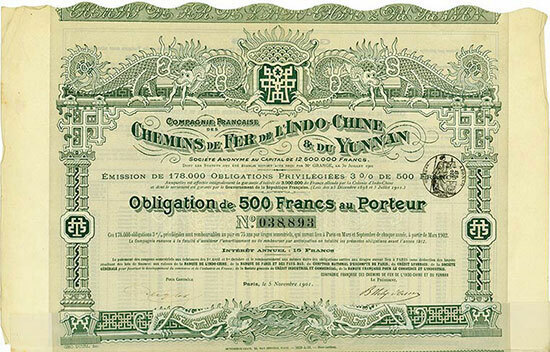 Paris, 5 November 1901, 3 % Bond for 500 Francs, #38893, 33 x 36 cm, grey, green-grey, some coupons remaining (stuck on), vertical fold, superb design. Die Gesellschaft baute und betrieb Eisenbahnstrecken in Indochina und in der südwestlichen chinesischen Provinz Yunnan. The company built and operated railways in Indochina and in the Southwestern Chinese Province of Yunnan.